Millennials will each take about 25,676 SELFIES during their lifetime—when testing a new look, many turn to their camera instead of the mirror. Definition: Picture taken of yourself—usually with a smartphone or webcam—and often shared via social media. In 2003, Sony designed the first forward-facing smartphone camera, the Ericsson Z1010—it wasn’t meant for selfies, but rather for business meetings. By 2015, 95% of millennials had taken at least one selfie. 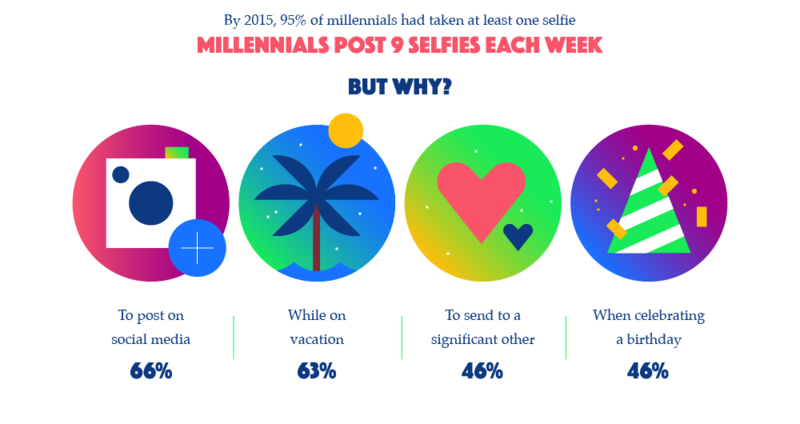 Millennials Post 9 Selfies Each Week—But Why? Why do so many more Snapchat users opt for selfies? The difference may be augmented reality (AR). 2015: Snapchat introduced a “RAINBOW BARFING” filter—the first use of augmented reality for selfies. Computer vision locates facial features and maps each user’s face. Mapping lets the filter adapt to facial movements in real time. 2016: Snapchat’s DOG FILTER was released, and quickly rose in popularity. In addition to adding dog ears, snout, and tongue to the users face, the filter also covers imperfections and elongates the user’s face. 2017: Snapchat launches LENS STUDIO. Desktop application allows anyone to create an AR filter. More than 30,000 LENSES were submitted to Snapchat in the first 2 months. 2018: Snapchat introduced SNAPPABLES. Game users can play on screen with augmented elements. Example: Players try to catch on-screen eggs by opening their mouths. Virtual Reality and the Selfie Facebook Spaces, a VR product for Oculus Rift and Touch controllers, allows friends to hang out in virtual reality, where their custom avatars can take selfies with virtual selfie sticks. From sitting on the edge of a cliff to standing on train tracks, many are seeking the most daring selfies possible. In Europe, about ½ of people would like to try a roller coaster that puts riders in control of capturing their own experience. Drones, controlled by a smartphone, will make extreme selfies easier to capture. More than 1 in 3 European consumers would feel more secure using selfies as passwords for banking. Apple’s iPhone X uses Face ID to unlock your smartphone with a look. Augmented Reality is moving selfies beyond social media—and changing the way we see ourselves.